Everyone can always use dishtowels, right? I mean seriously. No matter how inventive dish-washer manufactures are, there are simply a number of items that don’t fit. Much less that favorite coffee mug or tea cup that is just right in your hand. Or various kitchen items that have been handed down in the family and are just too fragile to trust to modern standards of time and temperature. And, speaking of temperature – not all (or I really think most) plastics are truly dish-washer safe. Growing up in the 1950s – we didn’t have a dishwasher. In fact, we didn’t have one in the 1960s either. Nor in the 1970s when I lived in various apartments during University, Med School or Residency. I washed dishes, I air dried dishes and occasionally used a dish towel if I needed a particular item NOW. As I think back, I am not sure when a dishwasher became a standard appliance in my kitchen. Perhaps the 1990s? Thinking back that many living places and decades puts a strain on my memory. But there are some realities, even if you live in a location with enough resources to have one in your kitchen. If there are not several people in your household, you may run out of dishes before it is reasonable to run the dishwasher since you probably don’t use all that many items every day. It really isn’t particularly sanitary to leave items unwashed for days and days. It uses more water to rise/prewash dishes followed by a dishwasher cycle than it would to just wash the dishes in the first place. All of these thoughts lead me to dishtowels. Everyone needs a few. 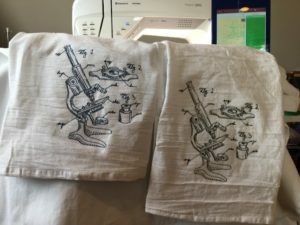 Flour sack dishtowels, bought in bulk, are inexpensive and provide a wonderful blank canvas on which to test out machine embroidery. If it doesn’t look great – hey, it is a dishtowel. If it does? Hey, presto! I have just created a nice present. Which leads me to the photo which started this particular discussion. If I am going to practice machine embroidery, the item should reflect the interests of the victim recipient, right? College guy is headed out for spring quarter. He is a science/engineering type. Since I haven’t found a schematic of a laser yet, he will have to settle for the microscope. We have an upright dishwasher – with two hands.